A very great toy ideal for all hamsters is the Hamster Flying Saucer (sometimes also referred to as the super silent spinning saucer). This saucer is very similar to a hamster wheel but seems to be a favourite to most types of hamsters especially dwarf hamsters. Hamster flying saucers come in various sizes, and one must acquire a hamster saucer depending on his/her hamster's size. For example a dwarf hamster will be ok with a small flying saucer, but a syrian hamster will need the medium or large flying saucer. 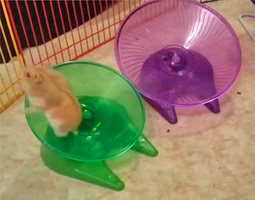 The Hamster Flying Saucer can be placed in the hamster's cage or even in the play area as you prefer. As mentioned above, even though the hamster flying saucer is sometimes also referred to as the super silent spinning saucer, after sometime, when the hamster constantly uses the flying saucer, it is not that silent. In that case, one may apply some olive oil or Vaseline to the saucer's axle.